I guess there's a triangle on f72v1, so I examined it more closely. At first, I thought it might be the pointer of a volvelle, but there were two problems: First, the position is not in the center of the circle (clearly to the right of it). Second, there are no obvious clues for the number and positions of additonal pointers in the large outer circle. Assuming that it makes sense to divide the inner circle into segments, one would most likely divide them into 12 equal parts. In fact, the triangle could be an hint that a division into 13 segments should be made. This is easy to be done by transferring the line segment AB. Then you can produce up to 12 more triangles. All steps are traceable on a drawing board ( or with drawing programs ). I don't know whether a division into 13 segments makes sense or not. For example, one could speculate that certain stars can only be marked this way. Then you would have number and position of other pointers. What do you think ? About '13' - of course there are 13 4-week months in the year, but whether that's to the point, or compatible with system of calculation used at the time and place the Vms diagram was first created is something you'd have to look into. 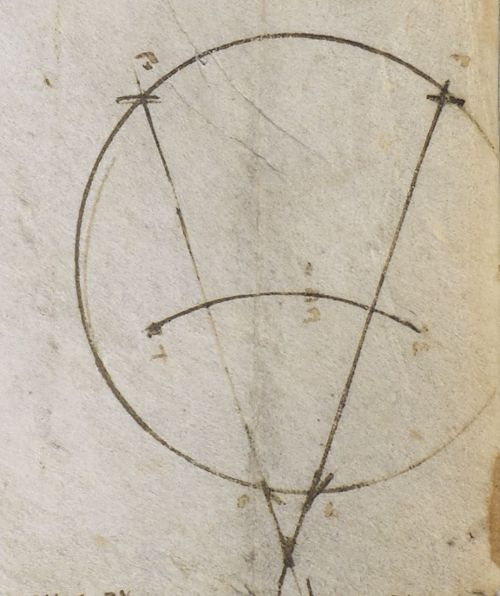 Seems to me that you've imposed on the drawing a type of diagram that's common enough in medieval texts about science, but which has never yet assisted our knowledge of the ms (though it has helped pad out holes in a number of tenuous theories). i recall a lot of dust and excitement about one diagram of the sort - didn't explain anything about the written or the pictorial text in Beinecke 408, of course, but it was fun. Here's that diagram. See You are not allowed to view links. Register or Login to view. Or 10878, British Library, Collection of scientific works, 1400-1449, folio You are not allowed to view links. Register or Login to view. . It is upside down, but that doesn't matter for the method. The missing baseline of the big triangle is also unimportant. I have only drawn it to check whether the division by the vertical line creates a certain aspect ratio of the sections or not. It's only important that position and height / angles are well comparable. - Hard to believe that the triangle in f72v1 is just a coincidence at this position. Scriba - as I see it your biggest problem is answering the question: If that's what they wanted drawn, why didn't they draw it? Probably because of Easter I just remembered @Diane's reference to the British Library, MS Harley 3734, You are not allowed to view links. Register or Login to view. . The conspicus thing here is not the diagram in the middle at itself, which determines the date of Easter, but the diagrams altogether. In the description of the BL, the third circle is described as unfinished. Could it be a sketched explanation of the diagram's layout in the middle ? The counterclockwise numbering is a bit strange. The numbers 1-15 on the left are clearly identifiable, but the last three on the right ( 11-13 ) are not. This is the position where you can see the angel in the upper circle. Anyway, the positions of 1 and 2 in the lower and middle circle are identical. There may have been a subsequent explanation on the next folio, but I can't verify that. 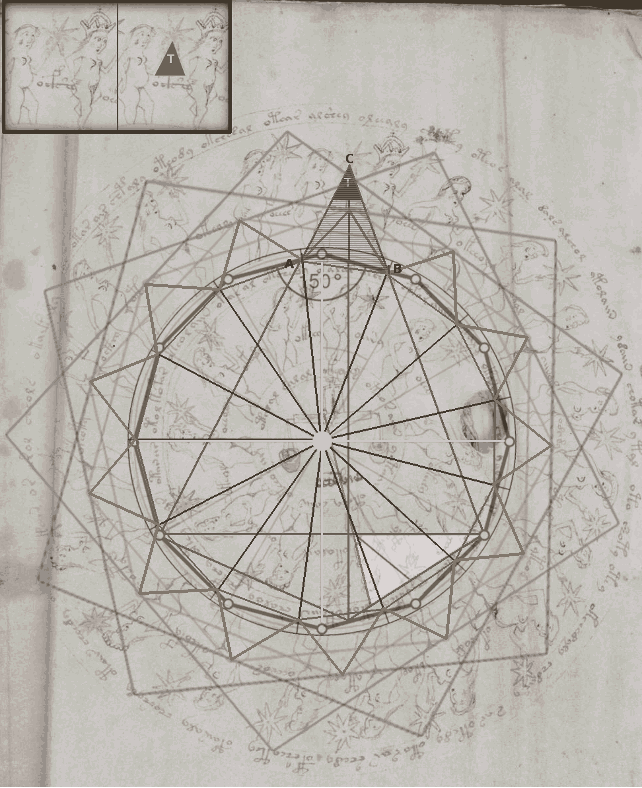 In any case, the unfinished diagrams I have seen so far are not labeled or numbered. Often they were obviously drawn incorrectly.